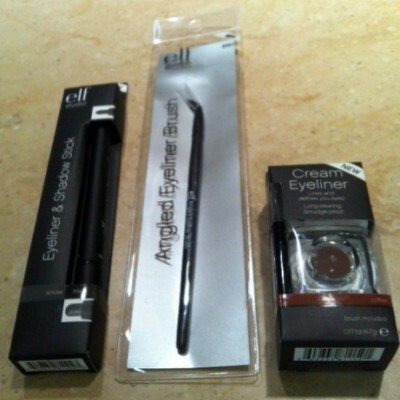 I bought three products–Cream Eyeliner in Coffee, an Angled Eyeliner Brush and an Eyeliner & Shadow Stick in smoke/black. I’ve never tried e.l.f (Eyes.Lips.Face) before, so I wasn’t sure what to expect. The e.l.f. Studio Makeup line was a nice surprise. The e.l.f. Cream Eyeliner applied with ease along the base of my lashes, although it was not as pigmented as other eyeliners I have. The Coffee shade is a medium brown color and I did go over the color a couple of times to build to the depth I wanted. To do that, I used the e.l.f. Angled Eyeliner Brush for application. This brush is made of Taklon and can be used wet or dry. This brush is excellent and I’ll just say–it’s actually better than an angled brush I have that cost much more. I also tried the e.l.f. Eyeliner & Shadow Stick in Smoke/Black; the Smoke side is the shadow and Black is the liner. As far as color, “Smoke” is gunmetal grey; a medium shade with a touch of shimmer. The shadow stick is creamy and applied easily, although I got the longest wear when applied over an eyeshadow base. Overall, I liked the black packaging–the products definitely didn’t look like they only cost $3. I think that if you’re a person that likes a lot of variety in their makeup or colors, then experimenting with the e.l.f. 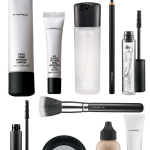 Studio Makeup Line might be worth a try. I definitely like the Angled Eyeliner Brush and plan to keep that one in regular rotation! In addition to a complete makeup collection, there are a variety of studio makeup palettes and gifts for the holiday season, all very affordably priced. The Gem Tools would make a great gift for someone that loves their bling! You can find the budget-friendly e.l.f. 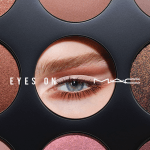 Studio Makeup line at eyeslipsface.com and at discount retailers like Target. Have you tried the e.l.f. Studio Makeup line? What was your experience? Disclaimer: Although this is a sponsored post, my thoughts regarding the products and review are strictly my own.